Mumbai- While Maharashtra government is looking for the support of Bollywood actor Amir Khan (Anchor of popular T.V. Show � Satyamev Jayate) to fight against illegal female foeticide, a scandalous exposure of a monster doctor couple from the state has come into the highlight. According to recent news published in daily.bhaskar.com, a doctor couple from Mumbai has been arrested for their involvement in the illegal female foeticide. 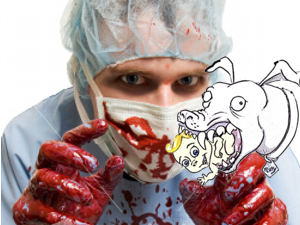 The more shocking and dreadful fact is that they used to feed female foetuses to their dogs in order to destroy the evidence, a state health department investigation report stated. Notably, Dr. Sundam Munde was arrested and charged under Pre-Conception and Pre-Natal Diagnostic Techniques (PCPNDT) Act�last week. What is more shocking is that his wife (Dr Saraswati Munde) was also involved in this horrible act. �The doctor couple had 4 pet dogs and they used to feed female foetuses after performing illegal female foeticide. The corrupt practices of Dr. Sundam Munde came into headlines when a 6 month pregnant woman, Vijaymala Patekar died in the course of abortion in his clinic in the Parli Tehsil on May 18. It is worth mentioning that a couple of years ago, heath department officials has cancelled Munde�s operating license (after sealing his ultrasound machine)� and his wife (Dr. Saraswati Munde) was caught in a sting operation conducted by Lekh Ladki Abhiyan – An NGO working to save the girl child and fighting against female foeticide. Now again, solid evidences have been found against the doctor couple following which the Maharashtra Health Minister Suresh Shetty has ordered for a probe by Crime Branch Investigation Department (CBI) of India. Shocking. Are they really humans? Mrs. Nidhi! Such bastards don’t deserve to be called ‘human beings’. They are stigma to the whole humanity and such devils should be hanged till death so that no other doctor dare to disgrace this noble profession.